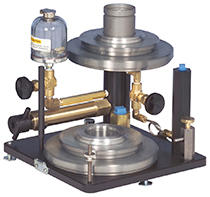 The HydraLite Tester is a primary standard available as a dead weight tester or a gauge. Both feature a re-entrant type measuring piston and cylinder assembly. This design reduces the rate of fluid leakage and increases float time, helping to maintain accuracy as test pressures increase. Each tester features an easy-to-use, convenient screw pump as the pressure source, which contains a ratchet feature that prevents the unit from depressurizing unexpectedly. Designed for lab or field use, each tester is completely self-contained within the cover of the unit.